Karl Martin, co-founder of Nymi and University of Toronto grad. What does it take for aspiring new companies to create impact and maintain staying power? In an effort to boost the odds of other’s success, ten of Canada’s leading entrepreneurs recently provided tips to business students at the University of Toronto. Tiff Macklem, the dean of U of T’s Rotman School of Management, said although Canadians have innovative ideas, what Canadian startup companies are lacking is great business judgement, adding it’s not easily attainable. “A new venture cannot simply go downtown and purchase a unit of business judgment,” said Macklem. That’s why the U of T Entrepreneurship network of incubators, accelerators and programs, including at Rotman, are linking beginner companies with successful mentors to gain in-depth knowledge on tried and tested methods to get their business on its feet and gain momentum. 1. 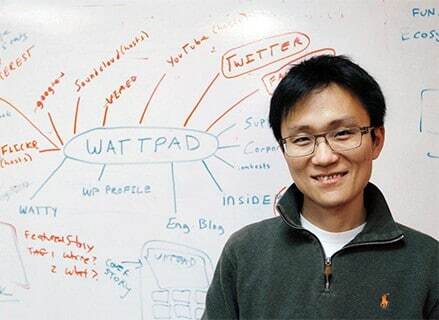 “As an entrepreneur, the best product you can build is yourself,” says Allen Lau, who is the CEO and co-founder of Wattpad, an online story-sharing community. 2. “Find a business idea you feel passionate about.” Cynthia Goh is the academic director of University of Toronto Entrepreneurship and the founding director of U of T’s Impact Centre, a business incubator. 3. “Get an advanced degree, and set audacious goals.” Kristjan Sigurdson is the associate director of the Creative Destruction Lab and a PhD candidate at the Rotman School of Management. 4. “Accept that sometimes you’ll be unlucky, and move on,” says Daniel Debow is a serial entrepreneur and an adjunct professor of law at U of T.
As an entrepreneur, the best product you can build is yourself,” says Wattpad CEO Allen Lau. 5. “Spend at least one day a week cultivating relationships with investors,” says Anthony Lacavera, who is the founder and chairman of the Globalive Group. Lacavera also founded Wind Mobile, which was sold in 2015 to Shaw Communications for $1.6 billion. 6. “Test out your ideas in the real world. Don’t get caught in analysis paralysis,” says Toni Allen, who is the founding partner of R3VE Business Design Inc., which specializes in user experience and business innovation. 7. “Choose your business partners carefully and communicate openly and honestly with each other,” says Sonya Amin, who is the director, client services, of AXS Studio, which she co-founded in 2004 with fellow U of T alumni Eddy Xuan and Jason Sharpe. “Skate to where the puck is going,” says League CEO Mike Serbinis. 8. “Don’t mistake expressions of interest from potential customers as evidence that you’ve tapped into a viable market,” says Karl Martin, who is the co-founder and chief technology officer for Nymi, a tech company that allows users to gain access to their devices by wearing a wristband that detects their unique heart pattern. 9. “Be prepared to act quickly when faced with a big challenge.” Kim Shannon is the founder, president and co-chief investment officer of Sionna Investment Managers, which has assets of $5 billion. 10. “Skate to where the puck is going.” Michael Serbinis is the the founder and CEO of League, a digital health insurance platform. Previously, he co-founded Kobo, the e-reader service.